Picture a massive cargo ship gliding through the water at 23 knots, or just over 26 mph (41.84 km/h). The captain receives a call from headquarters saying to turn back immediately for a new assignment. The ship would have to travel another mile or more just to make the first 90-degree turn. If the same ship had to come to a complete stop, it would take about 20 minutes to do so. Big ships take a long time to execute small operations. Like cargo ships, large chemical producers may also lack the nimbleness for quick turnarounds. They operate highly technical and capital-intensive processes that make them well suited for large volume production delivered via rail cars and bulk tank trucks. The efficiency of these operations can be impaired by more frequent schedule changes caused by the complexities involved with managing multiple packaging options. Further, these companies are commonly less efficient at shorter run, more labor-intensive operations such as small packaging. An experienced contract manufacturer can help with small packaging efforts for large chemical producers. Contract manufacturers are geared for flexibility and provide quick turnarounds while employing lower cost structures. They can handle small packaging jobs, both liquid and powder, quickly and cost-effectively. Contract manufacturers provide many benefits to a chemical producer that would traditionally be cost-prohibitive and labor-intensive for the chemical producer to implement on their own. The shorter lead times and fast deliveries of small packaging provided by contract manufacturers can be instrumental to success for a chemical producer. Contract manufacturers are designed for efficiency and flexibility. That is what makes them well-equipped to handle small packaging assignments on behalf of chemical producers. 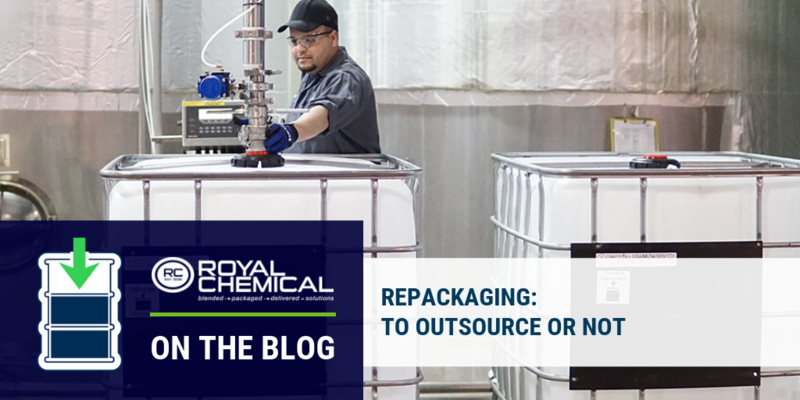 To learn more about the advantages of outsourcing your packaging needs to a contract manufacturer, contact the Royal Chemical team and request your no-obligation consultation.